Ain't it Grand, when it's dancing on the sand? We've not got anything approaching a price or the markets the Samsung Galaxy Grand is coming to, but if it's the good ones at a low price, some users could certainly be attracted. The Samsung Galaxy Grand is the phone that promises to bring the best of the Samsung Galaxy S3 and Galaxy Note 2 in a more affordable smartphone, while not skimping too much on the specs. Well, actually that's a little misleading, since the specs on the Grand are nowhere near those on the flagship range, but it does strike a nice design balance between the two top-end marvels. The Galaxy Grand comes with a 5-inch screen, for instance, which means users who are fans of the larger screen size will find something to love here. Let's hope they haven't clocked one of the aforementioned higher-res Galaxy models though, as the Grand has a shockingly low WVGA resolution on offer. You might wonder why we're so shocked; well, at the larger 5-inch screen size, those pixels are getting pretty stretched indeed, leading to a 187ppi resolution. This might not matter to some who just love a larger screen on the go, but if you see most of the new (admittedly more expensive) phones emerging at the moment, you'll struggle to not feel like you're getting a last-gen model. However, further under the hood things really start to pick up, spec-wise. For instance, there's a 1.2GHz dual-core processer with 1GB of RAM, and this keeps the Galaxy Grand ticking along nicely no matter what we threw at it. There are a bunch of new widgets to play with as well, which make it somewhat more of a desirable proposition. The camera on the back of the Samsung Galaxy Grand is an 8MP affair, and with an LED flash, a 2MP camera on the front and the ability to record in 1080p at 30fps, there's not a lot we can fault here. The speed of the shutter was impressively quick too, and as you can see the front-facing camera takes excellent pictures. We couldn't see a hint of NFC on the model we were checking out, which was odd for a device of this calibre, and especially given Samsung's intent on making everything tappable. However, there could be multiple variants of the device, so we won't mark it down on that front just yet. The model we checked out also had space for a double SIM combination. This means that it could be foisted on the emerging markets, or for the user who doesn't want to spend a fortune to have a phone with two phone lines on one device. The Samsung Galaxy Grand sadly doesn't come with an S Pen to call its own, but given there's no 'Note' in the nomenclature, it's hardly surprising. You can sketch around with your finger on the larger display, but in reality we can't see you ever doing such. Mappers will be pleased to note that the phone comes with GLONASS support to back up the GPS onboard, meaning faster locking on the go - we couldn't try that out in the packed conference centre, but it's good to see it popping up on the spec sheet. We were impressed with the web browsing ability of the Samsung Galaxy Grand, although only by the speed rather than the quality of the pages being served up. Like others in the Galaxy range, the Grand struggles with a low pixel count and subsequently doesn't give the best video playback or website rendering, especially when zoomed out. A lot of the verdict we give the Samsung Galaxy Grand depends on the price the phone will debut at, and we don't have that yet. 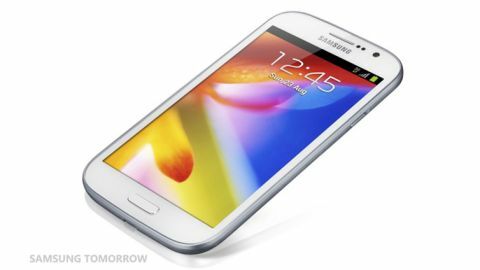 If it does fall somewhere between the middle and low ranges of the market, Samsung could have a hit on its hands. If it's any higher than that, then that screen will be a real letdown. Holding it to your head doesn't make you feel like you're holding a comedy phone, though that could be because we're all used to larger handsets now - it certainly feels better than the Galaxy Note 2.